Plantation forests not only impact carbon and water cycles, but also affect biodiversity, livelihoods, and shape regional economies. Each of these impacts differs across varying scales of analysis. This paper illustrates how forest, climate change and hydrology debates play out in the context of the forest plantations of Australian black wattle (Acacia mearnsii) in the upper Palni hills of southern India. We outline the contradictory perspectives of different local groups regarding the impact of plantations on catchment hydrology and water availability, and examine these in relation to changes in the regional economy and rainfall patterns. 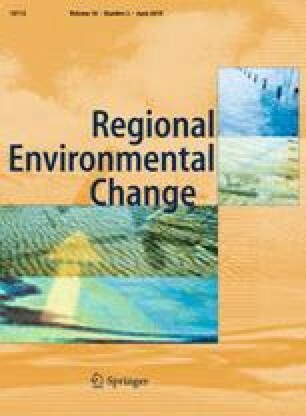 Our analysis indicates that changes in these two factors have played a more significant role than existing wattle plantations in affecting local and regional water availability. We suggest that ongoing debates regarding forest plantation–hydrology–climate change relationships need to broaden their scope to include changes in regional rainfall patterns and shifts in regional economic activity. This approach is likely to provide a more realistic assessment of plantation forests in a dynamic regional context, and offer more resilient strategies for regional landscape and catchment management under conditions of high variability in rainfall patterns. This research was funded by the Australian Research Council (DP 0666131). The authors are grateful to Mr. Sakthivelu of the Bryant Park Botanical Gardens in Kodaikanal, Ms. Girija Viraraghavan, M.S. Viraraghavan, Mr. Antony, and other members of the Palni Hills Conservation Council; Bob Stewart and Tanya Balcar of the Vattakanal Conservation Trust; the District Forest Officer, Kodaikanal Division; the leather goods manufacturers in Chennai; and respondents from Kodaikanal, Poombarai, Mannavanur, Kavunji, Kookal, Poondi, and Polur for useful insights and information. We also thank Phil Scamp for cartographic assistance and Craig Thorburn and two anonymous reviewers for their constructive comments on previous drafts.